Black holes cannot be seen because they do not emit visible light or any electromagnetic radiation. Then how do astronomers infer their existence? I think it's now almost established in the scientific community that black holes do exist and certainly, there is a supermassive black hole at the centre of our galaxy. What is the evidence for this? Black holes cannot be seen because they do not emit visible light or any electromagnetic radiation. This is not absolutely correct in the sense that visible light is emitted during the capture of charged matter from the radiation as it is falling into the strong gravitational potential of the black hole, but it is not strong enough to characterize a discovery of a black hole. X rays are also emitted if the acceleration of the charged particles if high, as is expected by a black hole attractive sink. Doppler studies of this blue supergiant in Cygnus indicate a period of 5.6 days in orbit around an unseen companion. An x-ray source was discovered in the constellation Cygnus in 1972 (Cygnus X-1). X-ray sources are candidates for black holes because matter streaming into black holes will be ionized and greatly accelerated, producing x-rays. A blue supergiant star, about 25 times the mass of the sun, was found which is apparently orbiting about the x-ray source. So something massive but non-luminous is there (neutron star or black hole). Doppler studies of the blue supergiant indicate a revolution period of 5.6 days about the dark object. 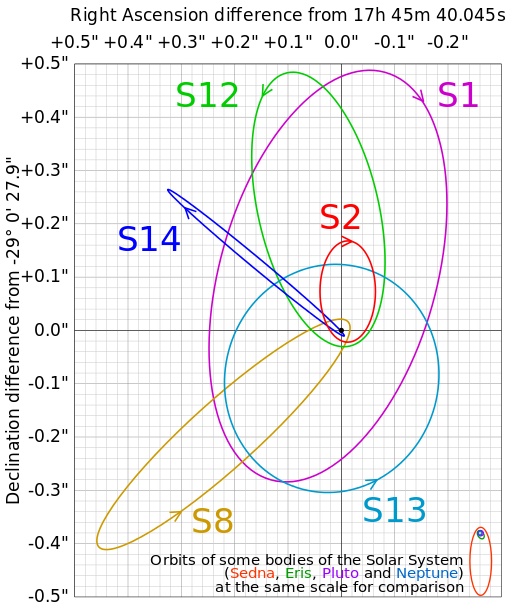 Using the period plus spectral measurements of the visible companion's orbital speed leads to a calculated system mass of about 35 solar masses. The calculated mass of the dark object is 8-10 solar masses; much too massive to be a neutron star which has a limit of about 3 solar masses - hence black hole. This is of course not a proof of a black hole - but it convinces most astronomers. Further evidence that strengthens the case for the unseen object being a black hole is the emission of X-rays from its location, an indication of temperatures in the millions of Kelvins. This X-ray source exhibits rapid variations, with time scales on the order of a millisecond. This suggests a source not larger than a light-millisecond or 300 km, so it is very compact. The only possibilities that we know that would place that much matter in such a small volume are black holes and neutron stars, and the consensus is that neutron stars can't be more massive than about 3 solar masses. Astronomers have found convincing evidence for a supermassive black hole in the center of our own Milky Way galaxy, the galaxy NGC 4258, the giant elliptical galaxy M87, and several others. Scientists verified the existence of the black holes by studying the speed of the clouds of gas orbiting those regions. In 1994, Hubble Space Telescope data measured the mass of an unseen object at the center of M87. Based on the motion of the material whirling about the center, the object is estimated to be about 3 billion times the mass of our Sun and appears to be concentrated into a space smaller than our solar system. Again, it is only a black hole that fits these data in our general relativity model of the universe. So the evidence for our galaxy is based on kinematic behavior of the stars and star systems at the center of our galaxy. If the black hole was situated in the middle of nowhere with no matter surrounding it, then indeed it would be quite hard to observe it. Any black hole with a considerable mass emits extremely tiny amount of Hawking radiation and that's it. However the black hole in the center of our galaxy is surrounded by matter. Thus we can observe it by its gravitational pull on this matter. First, you look at the surrounding stars and discover that they are orbiting something. But there's also matter in the vicinity of the black hole. Under its huge gravitational pull most of the matter is scattered around whereas a little bit is driven to inspiral until it falls on the black hole in the process known as accretion. The falling matter radiates primarily in the radio spectrum which results in it losing energy and falling further. We can see this radiation from the accreting matter. What we don't see however is the radiation from the object this matter falls on. Because of all the stuff falling, compressed at the surface and overheated any ordinary object would be very bright. Instead it's very dim as if all this matter simply disappeared at some point. This is consistent with existence of the black hole horizon. Similar principle works for other black hole candidates. We can observe its graviational pull on the surrounding matter and radiation from the accretion disc in its vicinity. Sagittarius A* (the black hole at the center of our galaxy) has some of the best observational evidence for black hole I have ever seen. Here, check out the animations from UCLA made from our observations. This is from data taken over a span of 20 years. You can see the bright spots (stars) orbiting around a patch of nothingness. The ones that get really close whip around at some insane speed but slow down quickly as they move away. Obviously, whatever is at the center has got a respectable amount of mass to it. But notice also that the stars always seem to move around something that is at the dead center (and their orbits are ellipses, which shows that we aren't just moving the camera to keep it at the center). Consider that, the mass of those stars must be insanely small next to the mass of the central body, otherwise it would be flung out into space the other direction when one star gets really close. So, here you can see massive stars orbiting something that gives off no light and must be orders of magnitude more massive than any of the stars around it. Well that seems to fit the profile of a black hole. Plus the mass that we calculate it must have is high enough that anything that massive and that compact would have to collapse into a black hole. P.S. If you didn't check out the videos, do. They're great; I love them. Short answer: There is compelling evidence for the existence of supermassive dark compact object at the center of the Milky Way, however the conclusion that this compact object is a black hole (and thus has a horizon) is far from established. Moreover, the statement “black holes exist in our Universe” may be fundamentally unfalsifiable, but alternatives to black holes can be ruled out or confirmed by experiments. Longer Answer. The center of our Galaxy hosts supermassive black hole candidate that is the best constrained by observations among other purported black holes. Its mass and distance have been accurately determined from orbits of nearby stars and its proper motion studies, and it has been established that high-frequency radio, and highly variable near-infrared and X-ray emission from this object originate from within a few Schwarzschild radii of this very compact object. Other answers list this evidence in greater details, but let me emphasize the following: this is all evidence of massive dark compact object, not necessarily of the black hole. If we assume the validity of classical general relativity, there is only one possible interpretation: there is a black hole at the center of our galaxy. However, there is always a possibility that there is some new physics that becomes relevant in situations where a black hole would be formed in ordinary GR, physics that possibly would prevent the formation of horizon, the defining feature of a black hole. So, what could be an alternative to black hole? The general name is an exotic compact object (ECO). It can be seen as two regions glued together: the exterior of the black hole solution starting from some distance $r_g\cdot\epsilon$ (where $r_g$ is the Schwarzschild radius for a given mass of an ECO ) of the supposed horizon and the interior composed of some exotic stuff in a way that does not lead to the formation of the horizons. If the parameter $\epsilon$ is small enough, then most of the features one could expect from black holes: strong gravitational lensing, general relativistic behavior of the orbits near the ECO including photon sphere, ergosphere, formation of gravitational waves by mergers of the colliding ECO etc. could be present in these kind of objects. In classical GR it is impossible for any signal (EM or GW) to escape the surface of the horizon. So for any given effect of black hole it would be possible to choose small enough $\epsilon$ so that it would be impossible to distinguish between a true black hole and a hypothetical ECO which does not have a horizon, meaning that existence of black holes is unfalsifiable. There are various theoretical models that lead to the formation of ECOs instead of black holes. Most of them are based on somewhat speculative assumptions on the behavior of particular model of quantum gravity (or specific properties of matter content) in the strong regime. Cardoso, V., & Pani, P. (2017). Tests for the existence of black holes through gravitational wave echoes. Nature Astronomy, 1(9), 586, doi, arXiv, extended version. Holdom, B., & Ren, J. (2017). Not quite a black hole. Physical Review D, 95(8), 084034, doi, arXiv. Rapidly spinning ECOs often exhibit instability and lose angular momentum. Observation of large angular momentum of black hole candidates would rule such models out. Abedi, J., Dykaar, H., & Afshordi, N. (2017). Echoes from the Abyss: Tentative evidence for Planck-scale structure at black hole horizons. Physical Review D, 96(8), 082004, doi. Proposed Event Horizon Telescope could collect data on ECO. And so this cottage industry of black hole alternatives is mostly driven by the hope (however small) that observations of near-would-be horizon structure would give us a window into quantum gravity. First of all, Black Holes' accretion disks do emit radiation. That is one way that astronomers use to detect black holes, that is, observing incoming radiation. Another way is comparing the motion of objects with the motion expected from objects near black holes. This is relevant to your question: many astronomers have noticed that the motion of stars close to the center of our galaxy match the expected motion of stars in the presence of black holes. This is evidence of the presence of a massive black hole in the center of the Milky Way. Black holes are like your Death Metal loving neighbors who never leave their apartment: You can't see them, but you know for sure they are there. When you state that "black holes cannot be seen because they do not emit any electromagnetic radiation" you are nominally correct: The amount of Hawking radiation the large ones emit is so tiny that they actually form a shadow in front of the microwave background. But black holes interact gravitationally with their environment, in a dramatic fashion. The otherworldly acceleration of matter orbiting and falling into the black hole can result in rather spectacular emissions of radiation. This article from 2015 reports on X-ray emissions observed by the Chandra observatory in the radio galaxy Pictor A. The hypothesis is that the X-rays are synchrotron radiation originating in a high-energy particle jet which in turn originates close to the black hole in the center of the galaxy. In order to gain some perspective on the scale of events let's examine a few numbers. The power of the observed radiation is estimated to be around 2*1035 Watt. That's half a billion times the sun's entire energy output. The observable radiation is only a small fraction of the jet's power which is estimated to be 100 or 1000 times larger. That would make the energy output of the beams equal the energy output of a small-ish galaxy of stars. The beam has a diameter of several kilo-parsecs. That makes it wider than our galaxy's height, and is a substantial fraction of our galaxy's diameter. No known mechanisms outside black holes would be able to effect anything on that scale. You know your neighbors are there because they produce more noise than the entire rest of your apartment block. Not the answer you're looking for? Browse other questions tagged black-holes astrophysics astronomy galaxies milky-way or ask your own question. What methods can astronomers use to find a black hole? Could there be any alternative to a supermassive black hole that might explain Sgr A*? Before we realized that supermassive black holes were at the center of large galaxies, how did the models explain galaxies? Why do larger black holes emit less Hawking Radiation than smaller black holes? Why do galaxies have a super massive black hole at their center? Is there a relationship between a stellar-mass black hole and its host galaxy? Could dark matter be made of black holes?